Cora Carmack’s Roar was one of the big fantasy titles of this past year but the reveal for the sequel is finally here. 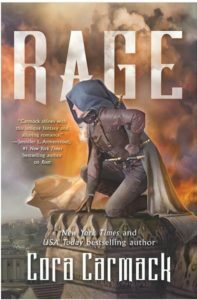 For those who do not yet know, the book will be called RAGE and the matching cover is very pretty. This is the cover that Cora revealed on her instagram earlier this morning. This cover really is stunning, though they remain very similar to the covers of Susan Dennard’s Truthwitch series. What do you guys think of the cover? Share your thoughts in the comments.